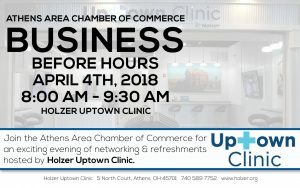 Join us at Holzer Uptown Clinic located at 5 N. Court in Athens for Business Before Hours on Wednesday, April 4th from 8:00am-9:30am. Join us for refreshments, networking, and to learn more about Holzer Uptown Clinic! This is a special add-on Business Before Hours – rescheduled from a snow day in January.